Like meat? Like puppets? 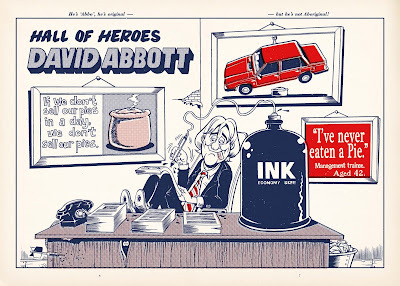 If the answer's yes then you'll soon be worshipping at the altar of Diesel's weird and wonderful Pete The Meat Puppet. 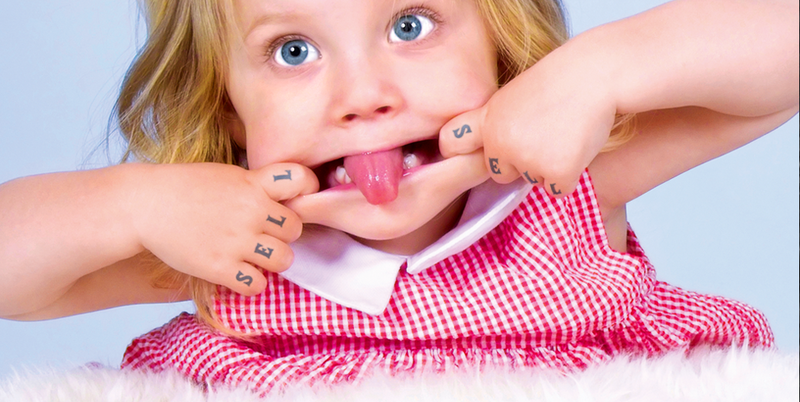 We're big fans of an insanely catchy ditty here at Sell! Sell! towers and Pete's signature tune can't get out of our heads at the moment. There's no doubt that Diesel have certainly captured the high ground for all things bizarre and esoteric. 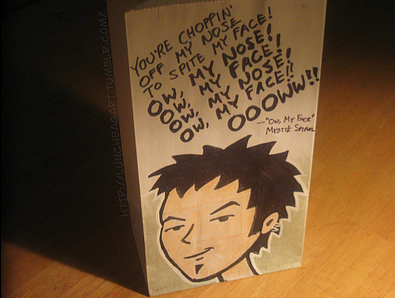 And Pete, their lovable animal tissue creation, is a fitting addition to the cult of the Diesel brand. Having watched it a couple of times I can't say it made me want to rush out and buy a snazzy pair of Diesel jeans. It did make me want to eat a kebab, though. The frightened passenger apologised to the driver and said he didn't realise a mere tap on the shoulder could frighten him so much. I've been driving a hearse for the last 25 years. It's Friday. Kick back. Loosen up a little. As a service to our loyal readers, we offer a classic song in karaoke format, so you can impress and amaze your friends, neighbours and colleagues. This week, We Are The World. 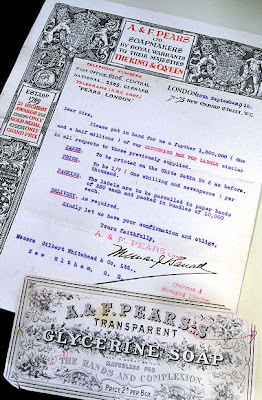 This Sunday is the Ephemera Society Fair at the Park Inn on Southampton Row. It should be a pretty good collection of printed ephemera, ranging from posters, playbills, invoices, stamps, photographs. If you're not busy and in London it might be worth popping over. Last week one of the best known design agencies in the UK closed it's doors. 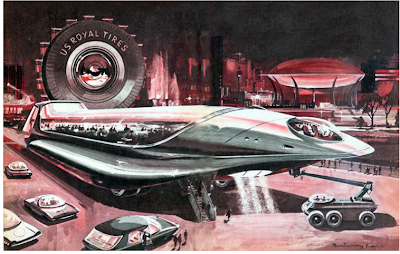 The Designers Republic. For a generation of young designers they were an inspiration and the reason they became designers. I was one of them. 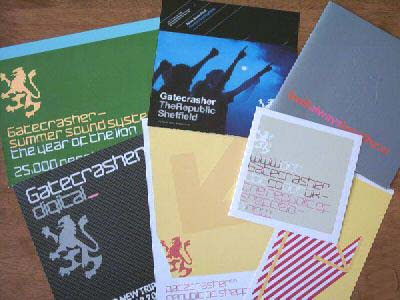 Since my teenage years I have collected flyers and the old Gatecrasher flyers designed by TDR are still firm favourites. A lot of flyers are crap but some are good, really good and worth collecting. Once you get a decent pile of them it makes for a nice bit of reference. Which leads me to this. An online library of old rave flyers. Brilliant. NB: I've just discovered that TDR still have their old website archived here. There's a ncie collection of their posters in there under retail therapy too. Last year the University of Lincoln organised a design auction to raise funds for their final year Graphic Design students and it was a massive success. This year they are doing the same again except in collaboration with the St. Bride Printing Library and giving the Library half the money raised. 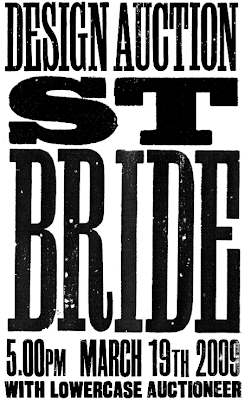 Lovely old letterpress type on the site as well. 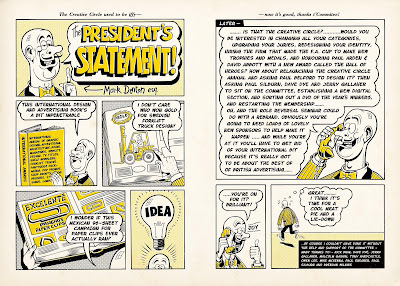 A great website that tells the story of visual communication with some good examples of work. Definitely worth a read if you need to brush up on your art and design theory. 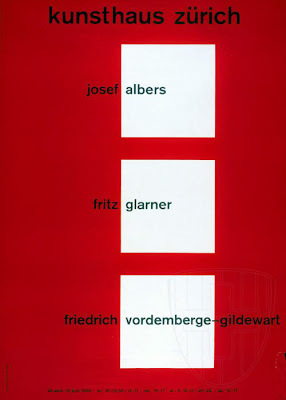 If you delve a little deeper there are some good galleries of work, Joseph Mueller-Brockman, Max Bill, Paul Rand, to name a few. Making Advertising That People Don't Ignore. Part One: It's Human Nature. 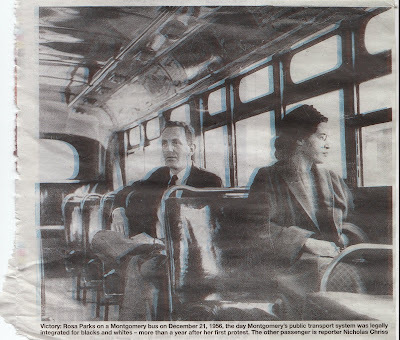 A while back we posted The Bus Test, which is basically about how the majority of print ads go unread and even unnoticed every day. Ads in most media do, to be honest, we just picked on print that day. And that's a good thing really. If everyone noticed and paid full attention to every commercial message that they are bombarded with each day (I think someone smart estimated the average at about 2000 per person per day) then we'd be overwhelmed with information - we'd be filled with so much nonsense that we probably wouldn't be capable of doing anything. So we filter out stuff. 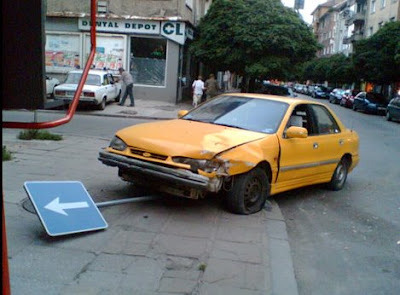 That's one of the reasons why making effective advertising these days is so challenging. People are naturally attuned to screening out commercial messages. 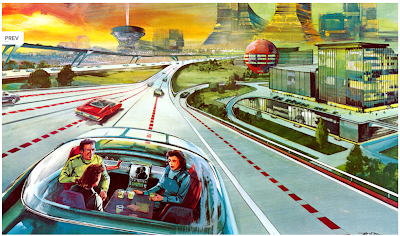 Much more so than, say, forty or fifty years ago. We tend to automatically ignore what isn't immediately interesting. Advertising today doesn't help itself generally. A lot of it is just wallpaper. Style over substance. Nonsense. But that should be music to the ears of the keen advertising person. Because that background of wallpaper advertising means that advertising that is genuinely unusual or surprising or manages to connect with the consumer, stands a strong chance of being noticed. When it comes to print advertising, or any advertising, but particularly print advertising, one really good start point is remembering that advertising is all about people. It doesn't matter what the product, service or cause is. Or what the brief is. Advertising is always targeting a person. Talking to a person. It's such a simple thing that it gets taken for granted. And forgotten. Resigned to the fine print of a briefing document. Target audience: 18-34 year old men with whippets. In these fast-paced, visual times, most creatives get straight to some visuals. The assumption is that no one is reading anything. What they forget is how they read a newspaper or magazine themselves. We are constantly scanning the pages as we turn, looking for something to catch our eye. Sometimes it's a picture, sometimes it's words. When we find something interesting, we spent more time with it. The always visual-first approach assumes that you're never going to get someone's time, so get it over with quickly - and sometimes that approach is spot-on. But sometimes it's far more powerful to connect to a reader through words - to earn their attention. Legendary adman Howard Luck Gossage said: People read what interests them, sometimes it's an ad. That was a while ago. But human nature is still human nature. If you can write something that is interesting to the reader, they'll read it. Even if it is an ad. 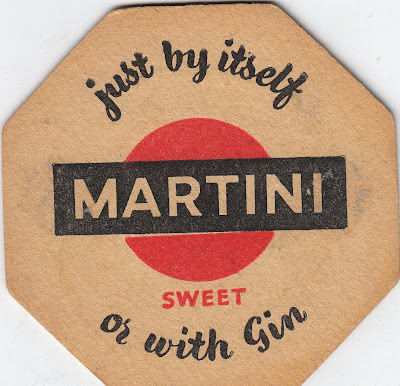 There's no doubt that the craft of the copywriter is being marginalised these days, and in turn it's dying out as less creatives put a priority on it - it doesn't seem as cool as a funny visual. Less creatives want to put the time in to think of something they can say that will really mean something to the reader/customer - finding a truth, or an insight, or a way of looking a something that will resonate. But if you do, it can be massively effective. It starts with understanding people. 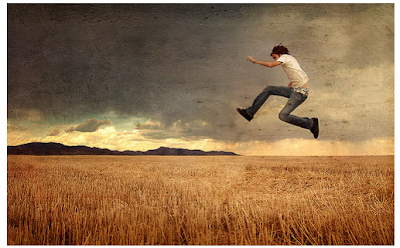 Being fascinated and excited by the way people of all kinds go about their lives. How they live, what they like. How they decide what they like. The subtle correlation of the rational and emotional reasons they buy or do different things. What moves them. Why they do this, that or t'other. You get the picture. If you're a creative, don't leave it to a planner to work this stuff out for you. The best advertising people are students of people, and people's ways. Not just artist or writers. Bill Bernbach said: It is insight into human nature that is the key to the communicator's skill. For whereas the writer is concerned with what he puts into his writings, the communicator is concerned with what the reader gets out of it. He therefore becomes a student of how people read or listen. Sometimes a simple statement, or sentence, insight, observation, or way of pitching something to someone can be far more powerful than the simplest of visuals. If you connect with someone like that, that is advertising that's hard to ignore. Early last year Polaroid decided to stop production of the very camera that made it famous, the instant camera. In an attempt to reposition itself as a global Consumer Electronics and Digital Imaging company they are leaving behind their Instant Film Production Company roots and closed their factories in Mexico and the Netherlands. Now though, a group of Instant Film enthusiasts have got together in a bid to restart production and resurrect the instant camera. They call themselves The Impossible Project and have until the end of the year to get the old factory in the Netherlands up and running again. Read more here and sign up to give your support as well. 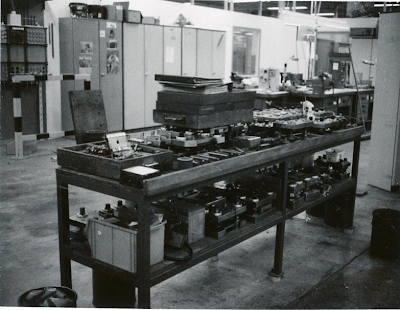 There are some old pics of the factory worth looking at too. This talented chap has been picked up on a few blogs already. Greg has a variety of good work. 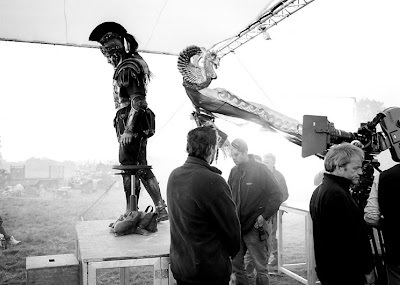 His behind-the-scenes shots on movie sets are particularly interesting. For the 2012 Olympic Games the Royal Mint are releasing a commemorative range of 50p coins. Each 50p based on an Olympic sport as part of a competition open to anyone to enter, more details here and on the rather annoying video above. A great opportunity, especially after the success of Matthew Dent's coins. I have 2 dogs & I was buying a large bag of Winalot in Tesco and as I was standing in the queue for the till. The woman behind me asked if I had a dog. 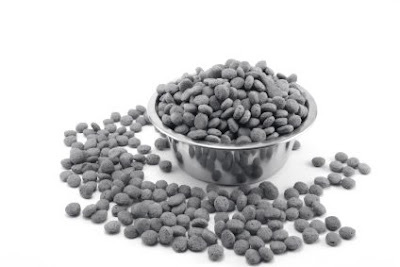 I told her that it was essentially a perfect diet and the way that it works is to load your trouser pockets with Winalot nuggets and simply eat one or two every time you feel hungry & that the food is nutritionally complete, so I was going to try it again. Horrified, she asked if I'd ended up in the hospital in that condition because I had been poisoned. I told her no, it was because I'd been sitting in the road licking my balls and a car hit me. I thought one guy was going to have a heart attack, as he was laughing so hard as he staggered out the door. Stupid cow...why else would I buy dog food. 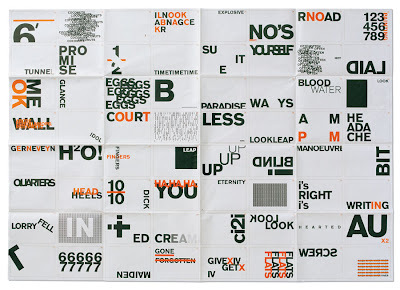 A few years ago I was at a lecture given by Pentagram's Harry Pearce, formerly of Lippa Pearce. He spoke about many aspects of his design career but it was his relationship with the late Alan Fletcher that stood out for me. It was Fletcher who influenced Pearce early in his career and led to Pearce's fascination with visual puns and typographic experiments. This has been an almost lifelong creative endeavor for his own personal satisfaction(see above) mostly but Pentagram asked Pearce to design their 2007 holiday book Decipher. Saks Fifth Avenue seen this holiday mail out and commissioned Pentagram and Pearce to do something for their holiday catalogue (below). You can read more about it and see all the conundrums here. 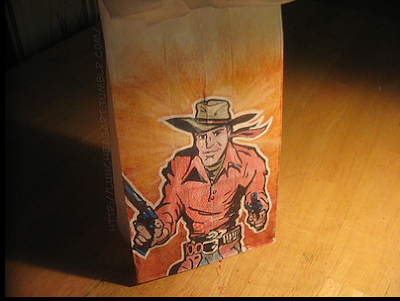 This is the tumblr blog of a Dad who spends his lunch breaks illustrating lunch bags for his kids. 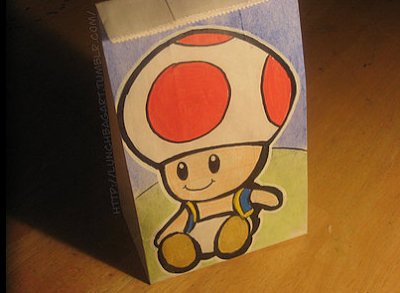 Some nice stuff, I bet his kids love finding out whats on their bag in the morning. 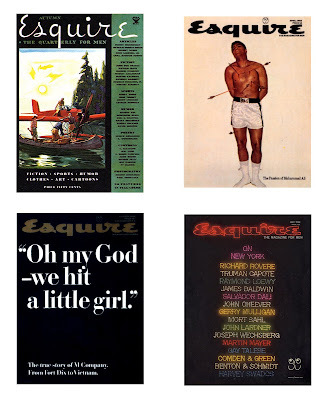 Every single Esquire (US) Cover in one big archive. User friendly and easy to flick through all the covers from 1933 to present day (see below). Some old favourites in there too but the last ten years are pretty uninspiring. 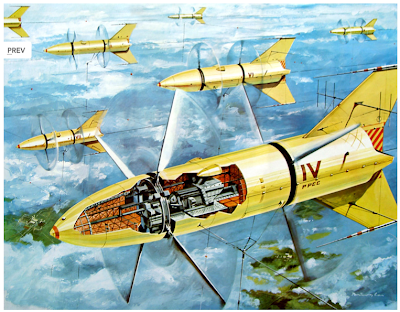 Some great "vintage retro-futuristic illustrations " over at Retro-Futurismus, all taken from German-language science & technology publications and science fiction. Most of the site is in German but the illustrations speak for themselves. Record Envelope - The little library of factory sleeves. And what a library it is. 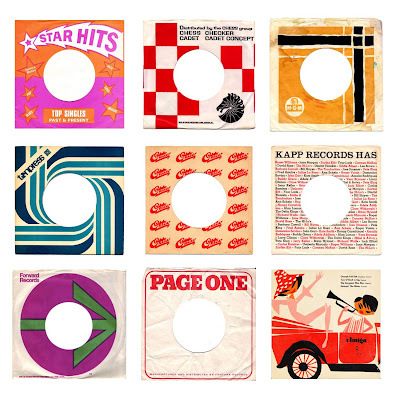 A great resource of meticulously cataloged old vinyl sleeves. Really interesting photography by Cole Rise. His flash website is slightly infuriating but he also has a flickr account. This photo is from his Surreal set. 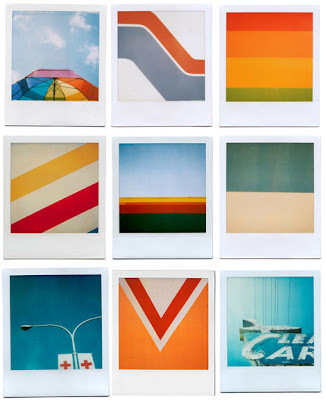 I just came across these brilliant Polaroids by photographer Grant Hamilton. 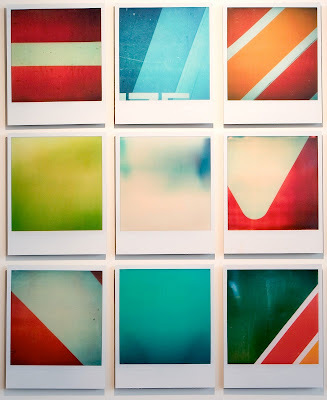 I love the geometric compositions, colours and analogue texture the Polaroid camera gives the photos. 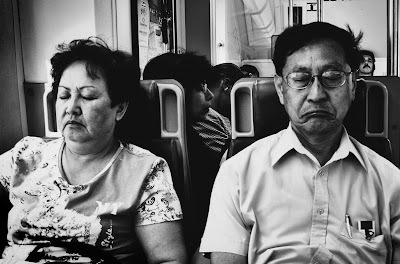 You can see more of Grant's work here on his flickr stream. Hot on the heels of our flickr beermat collection, we have just uploaded the covers of Creative Review's subscribers booklet Monograph here. 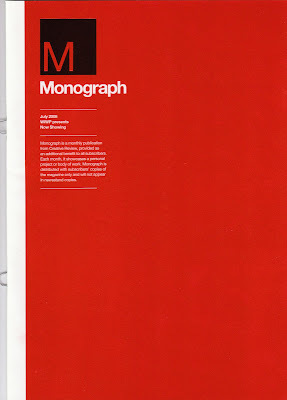 Monograph is a monthly publication showcasing personal projects or bodys of work. We will be adding more goodies and reference to this set and our flickr account over the coming weeks. After a prolonged Christmas/New Year holiday (we forgot about it), the Joke of the Week is back. He in the upper bunk and she in the lower. At 1:00 AM, the man leaned down and gently woke the woman saying, "Ma'am, I'm sorry to bother you, but would you be willing to reach into the closet to get me a second blanket? I'm awfully cold." How to sit properly has been a bit of a talking point in the studio this week. We have taken stock of some great new Herman Miller Aeron chairs and spent quite some time tinkering to get the optimum settings. If you sit in front of a computer incorrectly day after day it can really take its toll on your back. And creatives are some of the worst offenders. So if your reading this with a bit of a twinge in your back, have a look at this. 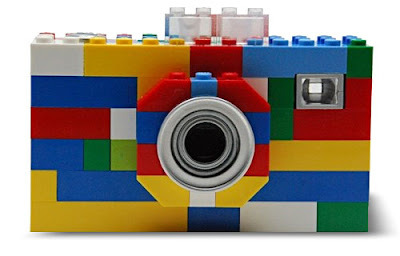 The world's best toy manufacturer have teamed up with DigitalBlue to produce a range of Lego cameras and other kids electronics. They may be for children but I'd quite like one of these. I wonder if you can add more bricks, like maybe some kind of headbrace so you could look a bit like the Borg out of Star Trek. Or maybe not. on 16.1.09 2 comments . Filed under: Nonsense. 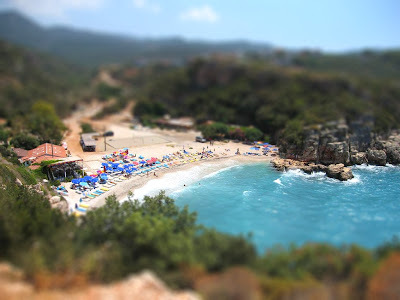 First we had the Poladroid now we have the Tiltshift Maker. All you have to do is upload a photo to the site, then have a fiddle with the settings and you have yourself a Tiltshift-esque photo. I had a quick go and the result wasn't great but a bit more patience, the right kind of photo and you should get a decent result. Or you could always do it properly. 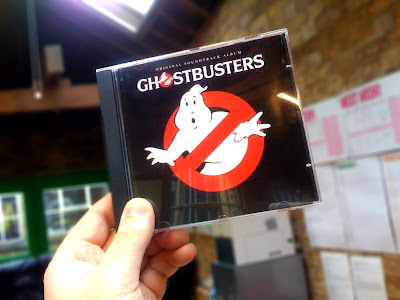 We're reliving that great year of 1984 with the Ghostbusters Original Soundtrack. Featuring such classics as Ghostbusters by Ray Parker Jr., In The Name Of Love by The Thompson Twins, I Can Wait Forever by Air Supply and Hot Night by Laura Branigan. An album more firmly rooted in the 1980's would be hard to find. Now, where's that perming lotion? Massimo Vignelli, modernist design legend, has just released a digital pdf version of his book The Vignelli Canon. It reveals the guidelines Vignelli Associates place on themselves for themselves. An interesting read and it reminded me again of how good Vignelli's work is. 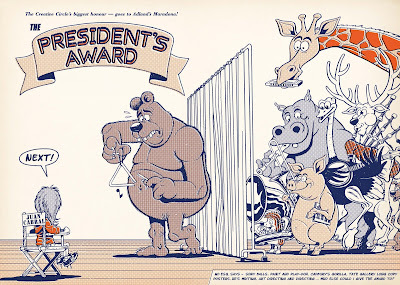 As anyone who knows me, or who reads this blog regularly knows, I'm not the world's biggest fan of the 'trade associations', clubs, and their awards. Although I know members who are smashing individuals, I generally find the clubs and awards a bit stuffy, self-congratulatory and insular. But I'm a fan of what's been going over at the Creative Circle lately. They've done that most simple but rare thing - specialised. In British Work. It's a bold move and I applaud it, not because I have a problem with work from overseas (in fact I find the best of US advertising puts British advertising to shame) but because it seems like all of the others are just interested in selling more and more entries, annuals and seats at the slap-up back-slap awards dinners. But the Creative circle now feels like it stands for something. Now if they can just continue being brave, and lead the fight against the general awards trend of over-awarding fashionable brands/agencies/people and under-rewarding the previously unfashionable, I'll be mightily impressed. 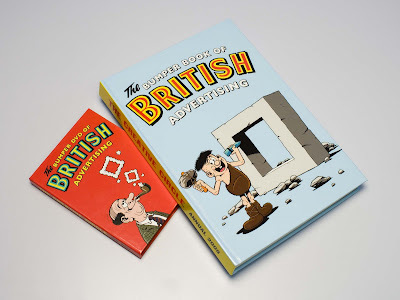 Their new annual is great, lovely look and feel (quintessentially British), typography and illustration - hats off to Mark Denton Esq., Dave Dye, Sean Doyle and Steve Bright and everyone else involved. Blimey, I might even join. 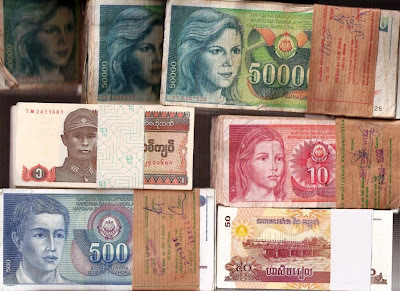 I came across this 'online exhibition' of bank notes. 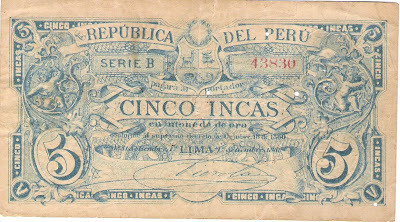 They have been purchased through ebay and there are a few nice ones here. 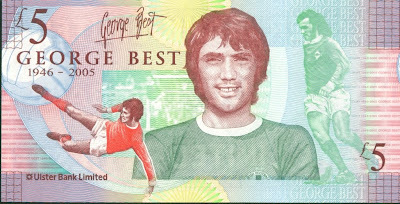 This got me thinking that their must be a flickr group dedicated to bank notes and I wasn't disappointed. Heres a few of them. This is what happens when the plates slip in newspaper printing. Most of the time it's a real ball ache, (the ad you've spent hours working on is unreadable) but on this occasion the photo above has quite a nice effect. It helps that the subject is quite important too. 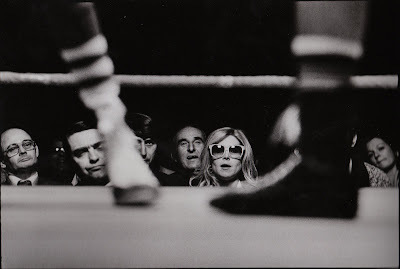 Ringside, a superb collection of 160 duotone photographs giving a great insight into the boxing world. Good book, lovely photography. 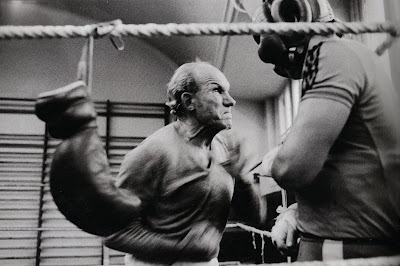 As editor-in-chief of the world-renowned Magnum agency, James Fox worked with many of the most famous names in photography. 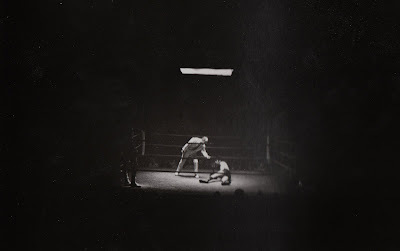 However, for almost thirty years he led a secret life as a photographer himself, chronicling the world of boxing. The hard-won trust and long-standing friendships he has found there have allowed him unprecedented access behind the scenes of this dramatic and dangerous sport, and the result is this remarkable collection that reveals the public and the private faces of the 'noble art' at its most enthralling. 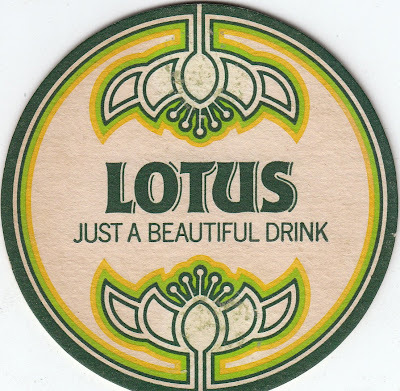 Previously we posted a few images of some vintage coasters. Our collection has grew a bit and we've created a flickr group specifically for them, check it out here. 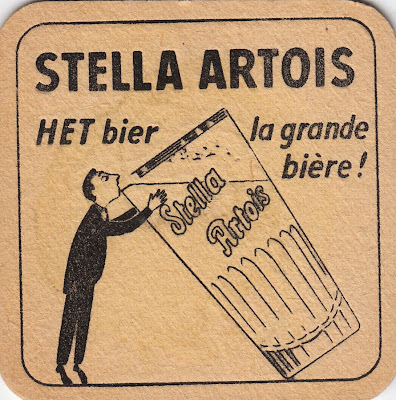 If you have any unwanted coasters/beermats we would gladly take them off your hands. I thought, that's nicely put together and well thought through - a name change ad that has a bit of intelligence and uses examples we can relate to, to give us a reference point. Yes, these celebrities changed their names to help them along, so why not a company? It all seemed to make sense, and I'm sure it wasn't just the warm glow of the yule making me feel all docile and agreeable, because as the ad concluded I was jerked out of my Christmas haze by the actual name they were changing to. 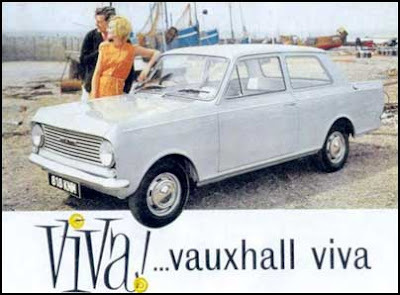 Now, I know the name Aviva has been around for a while, but here we are talking about changing a household name, a recognised name, to another one of those made up company names. I've heard of Norwich. It's a place. I've heard of Norwich Union, they feel like they've been around for longer than I have. Aviva is confusing, and meaningless on a massive scale. My only guess is that they employed Vic Reeves as brand consultant, and he came up with the name inspired by his Shooting Stars catchphrases Uvavu and Eranu - (you can listen to them here and here). You can read a bit more about it in this report from The Times. Well, why indeed? It seems like one of those unquestioned rules of modern business, that companies and brands should always rationalise their name across the world. But why? Sure, it might be right for some, but it doesn't make sense for everyone. Are companies just doing it for their own corporate ego? And why the desire to name them with meaningless names that have no human reference. It feels like businesses don't feel like they should fit snugly with the consumer anymore, they are taking business-speak into the real world and forcing upon their customers. I can't help but think that as business becomes bigger, more centralised and less human, in the long run it will have a negative effect on their relationship with their customers - no matter how much they spend on nice adverts. 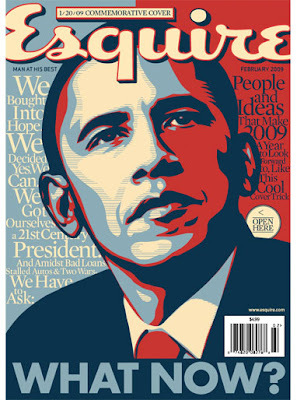 So here we are on the brink of 2009, a year that promises to be challenging and exciting, for lots of reasons. I'm very excited about the potential of what we've started here at Sell! Sell! - the friends and great clients we've met along the way this year, and what this new year might bring. 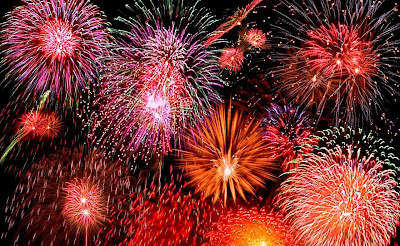 I just wanted to wish everyone - our friends new and old, clients, readers, and our competitors - a very happy and prosperous 2009 - the best of luck to you all. Let's all remember that this is a people business, and so the single most important thing is that we all look after the people in the business.